Go ahead pick a color - any color! We dare you - it's almost impossible, there are so many beautiful choices. This beautiful alpaca yarn is wonderful to knit. It is light and springy, and is great for blustery spring days and chilly winter nights. It breathes because it's a boucle, and it's light because it's alpaca. But it's so cozy when you need it to be. 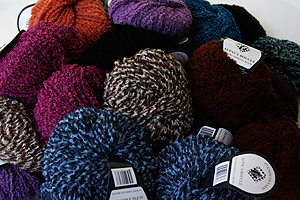 At 2.5 stitches per inch, this is a very satisfying yarn...at a great price! Please bear with us - this page is being updated to reflect new colors and pages showing you the range of Plymouth yarn's Alpaca boucle! This yarn has been discontinued - very little is left - and it changes all the time - we will contact you to confirm that we have what you ordered!